Chicago is undoubtedly a hub for gastropubs. Small plates, little-known ingredients, and pretentious service have defined most of the recent restaurant openings in the Windy City. However, with the new J. Rocco Italian Table Bar, we just might be on to something completely different: hearty, original Italian cooking. Headed by Chef Steve Chiappetti, J. Rocco is one of the best things to happen to the River North neighborhood. It’s a quaint Italian restaurant where patrons can really feel at home. It’s casual in nature (the servers wear jeans), original in cuisine (bacon-infused chicken meatballs, anyone? ), and priced affordably ($28-$38 per person for food, drink, tip). 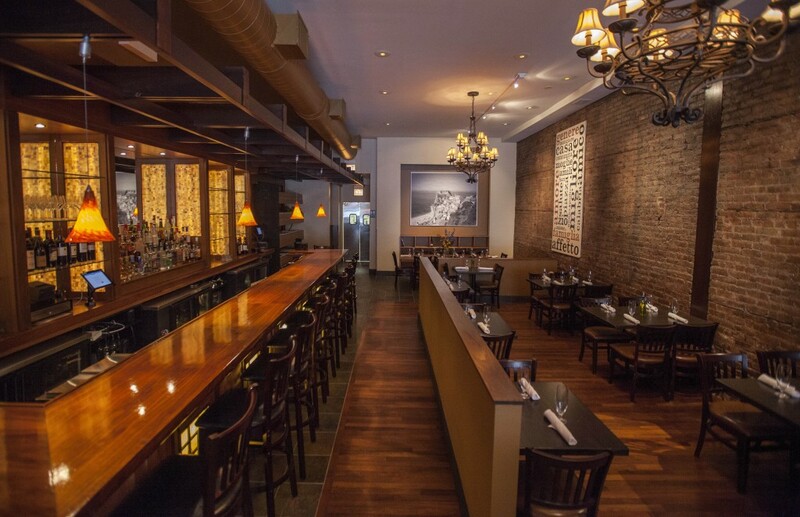 The interior is classic Italian eatery; nothing too trendy or fancy about it – just the way it should be. The menu is very simple and pays homage to their Calabrian heritage. But where there is “simple,” there is “delicious.” And there was no shortage of difficulty choosing which goodies we wanted. 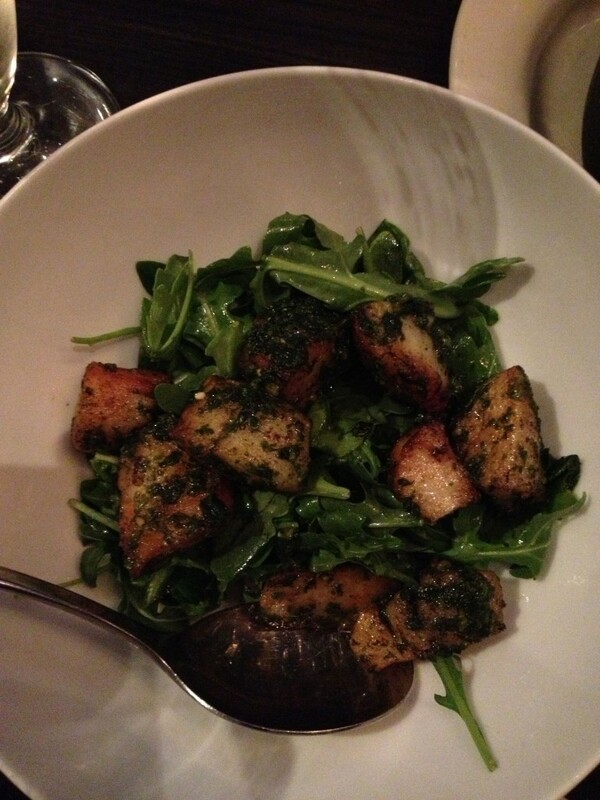 To begin, we went with their scallop which was seared, diced, rolled in pesto, and served over a bed of arugula. The presentation (chopped and served over lettuce) wasn’t what I was expecting, but the flavor was definitely there – which is what counts. 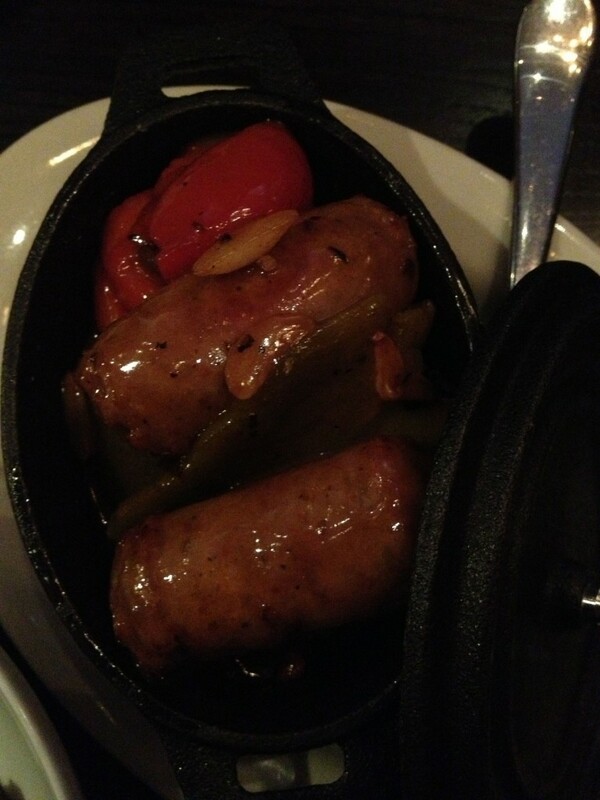 We also got the Italian sausage and peppers as an antipasti, which was served in a small cast iron pot with a lid; just like your Italian grandmother does it. The clear hit of the antipasti – and the one food I will be talking about for the rest of the year – was the chicken meatballs. Smoke and bacon infused ground chicken, rolled with pine nuts for taste and texture, then bathed in a roasted red pepper sauce: incredible. It won’t be long before a craving for these set in again. Pastas are handmade. And once you go handmade, you don’t go back. 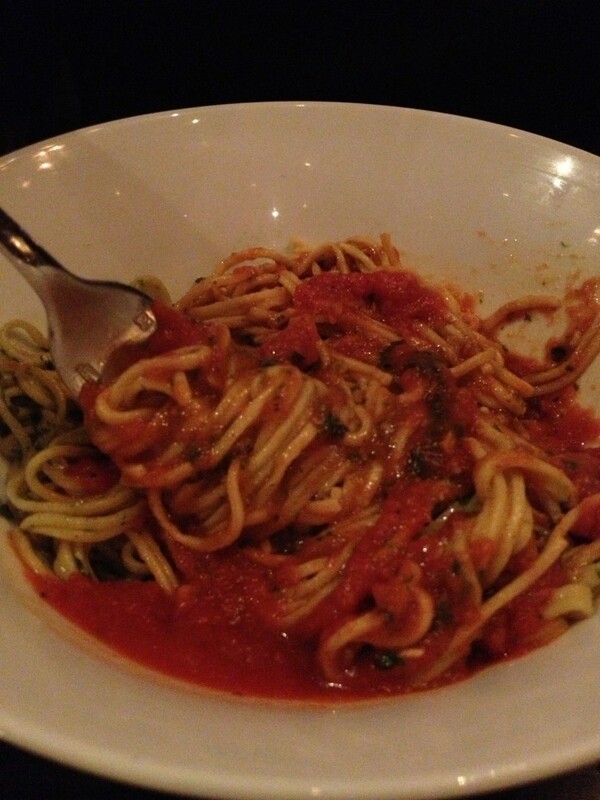 There were several appetizing options, but we went with the pesto-infused tagliolini with “frasca sauce” – a red sauce invented and named after one of the owners. Eggy and flavorful, these thin angel hair-like noodles were amazing. 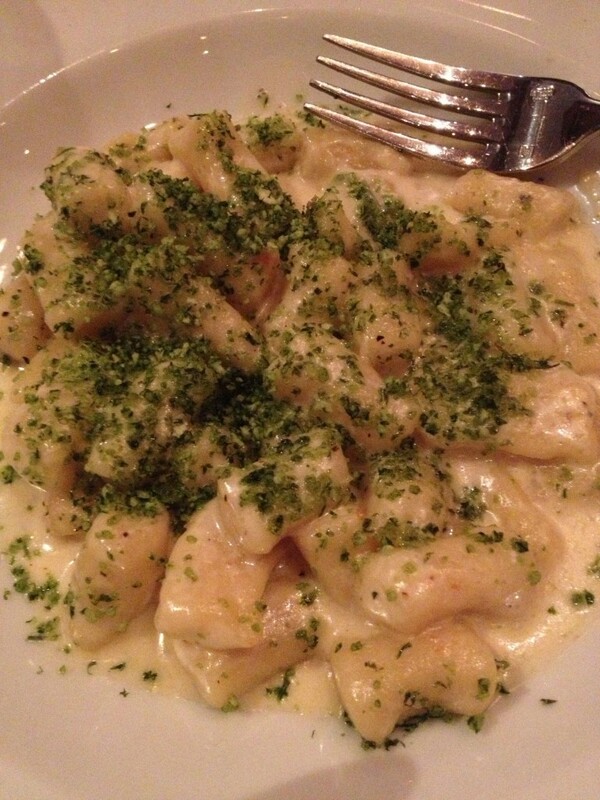 We also ordered the homemade gnocchi, which had an unbelievable flavor and texture that paired well with the not-too-heavy gorgonzola sauce. Though we didn’t have room for the pizzas, the apple/prosciutto/pecorino sounded right up my alley and is on the list for our next visit. Additionally, they have a range of entrees such as surgeon, bistecca (steak), and lamb that all sounded lovely as well. 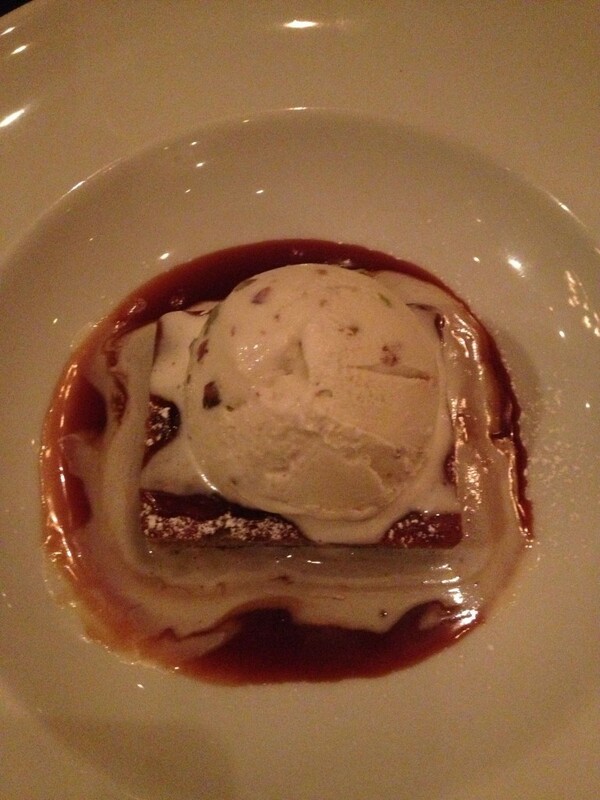 We finished our meals with a sweet treat: the signature pistachio cake with caramel sauce and a heaping scoop of gelato. If you never thought you were a fan of pistachio; this will make you change your ways. Not too sweet, perfectly moist, and served warm with a creamy, cold gelato…it just doesn’t get better. Service was absolutely pleasant. Friendly, knowledgeable, hospitable. You could tell our waiter, in particular, was passionate about wine and pairings and he shared his knowledge in a humble way, which piqued our interest in what we were consuming. His recommendations truly enhanced the cuisine which only made us clean our plates and want more. Bravo to their well-edited wine list, I must say. I truly wish J. Rocco the best of luck with their opening, but something tells me (perhaps it’s the chicken meatballs) that they won’t need it. Something also tells me that it won’t be long before this dinner-only spot starts serving lunch. For now, make your evening reservations now because they fill up fast – and for good reason.